Wait, we have a Forbidden Fortress? And am I the only one who finds ominous castles with names like that really unimpressive? It’s the very definition of trying too hard, dare I say, overcompensating for something? Ursula enters Maleficent castle (taking down a guard - or, as Not!Pam says “knocked out, strangled or tried to impregnate” since she doesn’t know what the tentacles are for) and Maleficent objects to this. Someone invited Ursula and it wasn’t Maleficent (which is just rude). They’re interrupted by two large dogs which Cruella seems to control with her halitosis. She was also invited. Maleficent is also not impressed. Rumplestiltskin, the one who invited them all, arrives before they start fighting. He’s pitching his plan of the villains getting the happy endings. Time for his pitch (in which he reveals he knows what they all secretly want), they need a Dark Curse that will get them all their Happily Ever After. This involves going through a series of traps each tailored to a villain’s talent to gain the curse. Of course, Rumple double crosses them and leaves them to die at the hands of the Chernobog, a demon that feeds on evil (actually a Slavic god as I recall). That leaves the 3 villains to fight it – and co-operate (it goes for the most evil which is apparently Maleficent). To the present and Storybrooke and everything is idyllic (and yes, that includes Regina, now mayor again, burning Mary Margaret’s sappy artwork cluttering up her gloriously stylish office). But there is something sinister underneath – the Blue Fairy and all her Fairy-Nuns are still missing (thanks to Rumple) and Killian and Belle are working on trying to release them, which means investigation. Which isn’t going to go well if Killian remains contemptuous of computers (and, Killian, that computer is way too out dated to be a magic box). Of course Killian is tortured by the guilt weasels because any attractive man who looks good in black leather and eyeliner simply has to have some darkly tortured angst to go with it. It’s a rule. Bella has similar guilt weasels but softer – Rumple tricked them both, it happens. Belle is also sad because she did love Rumple, despite how it ended between them. Drive through. That’s it, this season has won me. More worryingly, Regina leaves with Rumple’s dagger. Noooo do not make her evil. DO NOOOOOT! The lengths some people will go to to make you read their books! Further speculation is interrupted by a huge roar. In Regina’s words “I guess we should go out and see what’s killing property values this time.” Oh Regina! That would be a demon. A chernobog demon by the look of it. Hunting the person whose heart has the most potential for evil. Oh I smell a lot of angst from this one. It escaped the hat (the shadowy thing) and a loop hole in the hat is that once released it can’t be put back in. So Emma and Regina work together to throw magic at it because they’re epic when they co-operate and manage to drive it off – not kill it. Time for operation monster handling; Belle on research, Mary Margaret on innocent bystander wrangling, Killian on looking hot in leather and eye liner (essential role) – they work like an oiled machine now. To the town line in Emma’s car (Regina snarks because she’s Regina and awesome) and the Chernobog leaps on them – Regina refuses to let the demon kill them both and magically teleports out, intending to lead it away from Emma but they’re at the town lines and a lot of momentum gets them tossing the demon over the edge – to a land without magic where I assume it poofs and disappears. Or rampages round Maine. Either way it’s unlikely many people will notice. Joined by Mary Margaret and David they debate trusting Ursula and Cruella. For once, Mary Margaret is being sensible rather than the stunned ball of fluff and hope she always is, and votes against letting supervillains into town. Regina, understandably, can’t write them both off because she knows she was once worse than either of them. Regina and Emma may be wrong, but they’re more awesome so they overrule the Charmings. Yes, the Charmings were actually right. Mark it on the calendar, it won’t happen again. The ritual Belle got from an “Oxford professor” to open that hat was from him. All of which he did, on the outside, without magic. Because he’s Rumple and he may be evil but damn he’s good. Step 1 is finding Maleficent. But Ursula’s worried about Regina because she managed to match Chernobog though Rumple counters that Chernobog was after Emma, the greatest potential for evil. Mary Margaret and David decide to be threatening and warning to Cruella and Ursula. It’s like being menaced by a lettuce. But Mary Margaret also insists they don’t mention “what happened between us in the Enchanted Forest” otherwise Mary Margaret will rip out their hearts. I’d be impressed by the menace if there was any way she could back it up. I’m assuming that this was something evil, not slashbaiting. I’m sorry but even halitosis animal control does not bring Cruella up to the same league as Maleficent or Ursula. Though I want Ursula to show power beyond “has tentacles”. However her one liners are pretty good (almost on par with Maleficent. In fact, I already love the villains way more than I love Mary Margaret. Admittedly, this isn’t saying much). Also Drive Through villains. Regina and Emma have high promise this season without the usual antagonism – they’re far better not just as grudging allies but genuinely on the same side, with Emma commiserating Regina’s loss rather than causing them. I also think it’s worth noting the ceremony that involved giving Regina the Sorcerer’s Hat and the Dark One Dagger- ultimate cosmic power handed over to Regina without a second of hesitation or distrust. 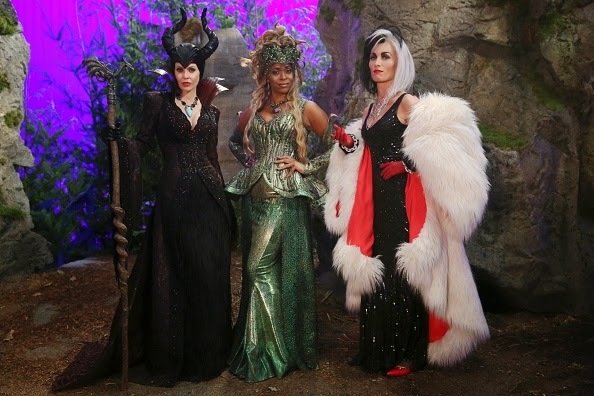 I do think Regina and Emma gave in to Ursula and Cruella a little early – they barely even tried to defeat the Chernobog before inviting evil villains to play.